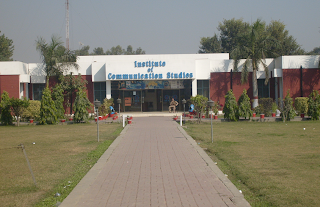 Institute of Communication Studies, also known as mass communication department is one of the department of University of Punjab, Lahore started its life back in 1941. It is situated at the New Campus of the PU, facing Lahore Canal. This department is dealing with the studies regarding media, journalism and similar disciplines.Though i have never got a chance to go inside the department but i do walk around it or have a glance at it almost regularly. I would like to share with you people what feeling the environment and students out there give regarding culture of this department. The scene is mostly like guys and girls doing chit chat, laughing, having fun sitting on roads, in car parking, in lawn and walking around. Students seem to be quite chilled out. since they are into media studies so the the way carry themselves is quite open, modern and liberal. We can say that its one of the departments of PU who kinda got modern lot in it, as PU has not got negative reputations when it comes to modernism and style of people out there etc. LOL. Being a Govt. institute, fees are lesser compared to other private institutes. Besides regular fees, you have to face other costs as well; like in presentation, you may have to organize something special to add value to you presentation, since its all related to media and communication studies, so cameras, making videos and other stuff like that can also be added to your costs etc. In Govt. Institutions, prevailing norm is that complain against teacher costs you most of the time, cost can be in form of insult, class room behavior of teacher gets impolite, tough marking etc. Or even if there is not any cost the complain remain unheard and unnoticed. In respective Institute, this norm prevails on moderate level. Sometimes complain is heard only, sometimes implemented, sometimes not even heard etc. Modern techniques are used by teachers like, multimedia, presenters etc, but still the course outlines and contents of the syllabus are not satisfactory. It needs more professionalism and content in it, some challenging way to make the students more competent. For the students who like to be relaxed, there is happy news that assignments are usually given once a week but students having thrust to work hard may not like it. And one more attractive thingy for most of the students, that marking in exams in not so tough it’s quite lenient. Internship is provided to each student in prestigious organizations. A number of practical training activities on regular basis are undertaken by the students in all the courses offered by the School and the evaluation hinges upon a continuous assessment of the students performance throughout the program. Students are also encouraged to bring their talent to front; they are encouraged to participate in co-curricular activities at both institutional and national level. Events at Institute are held often. It includes conferences, seminars, welcome, farewell and others. tours are also arranged for students with in country. Basic Information: Enjoying 69th year of its existence, it is striving to achieve the best place for students to learn and get trained to compete in the industry. Utilizing knowledge and experience of competent teachers, this institute is preparing best out of whole lot. The Institute has very experienced and qualified faculty. There are 6 Ph. D and 1 M. Phil in its permanent faculty of 9. Special lecturers of top most professionals are also arranged frequently. It holds a strong alumni and fresh graduates get job in renowned places in the industry. Students get admissions after Intermediate, Bachelors, Masters' Degree and also come for Diploma courses being conducted in it. For Undergraduate Program there is only morning session, whereas classes are also conducted in the evening for different programs. Student Talk: On asking one student from the respective department about the institute, he told that its good to be a part of this institute. Certain things are really good and you have to compromise on some as well. Like, talking about the faculty he said that its a mixture of brilliance, good and average. He appreciated the Library and Computer Lab but on the other hand he said that number of class rooms are in sufficient for whole lot of the students. And furthermore, he also told that lack of common room and ground is niggling. There wasn't a cafeteria previously in the department, but its now there. Talking about studies he told that these should be improved, right now course outlines and overall studies are not very much challenging. Developments are not made rapidly and on continuous basis, rather its gradually slow process, some teachers change tradition while others keep their way and content same as previous. Overall he was almost a satisfied student. Facilities: With the facilities of a modem departmental library, Computer Lab, photo Lab, Video Editing Lab,Photo copy shop, Students also enjoy all university facilities i.e. transport, medical, hostel residence, main library membership, study and excursion tours, and sports facilities. cafeteria has also opened now with number snack food and other item for students. Students are also having multimedia and projectors' facilities to showcase there work and as complements to study. Market Worth: It holds good reputation and name in the market. Students after getting their degrees get competent jobs in all over the country. As of now media in our country has grown very vast, number of channels have been launched, so there are career opportunities for the students holding degree of this institute. Every day people absorb an collection of information from news, radio, advertisements, and many more. The people behind our information driven culture are the trained professionals of the mass communications industry. There are many number of best mass communication colleges in Pune, so you can make your future in mass communication from pune, Maharashtra.